What is contra dancing? According to Les Francey and Farrell Boyce of Hamilton Contra Dances, "Contra dancing is a form of North American folk dance in which the dancers form a set of two parallel lines which run the length of the hall. Each dance consists of a sequence of moves that ends with couples having progressed one position up or down the set. As the sequence is repeated, a couple will eventually dance with every other couple in the set." Contra dancing provides wholesome activity in a relaxed, alcohol-free and smoke-free environment, with active, friendly people of all ages, including families. Additionally, contra dancing has the benefit of being an aerobic workout. Why is it called contra? There are two schools of thought on how contra dancing was named. One is that the French, who took up English country dance, converted the name to contredanse or contra-dance. The other theory holds that contra is an English corruption of the French phrase au contraire, which indicates opposites because the dancers are arranged in opposing lines. I've heard that it's similar to square dancing. Is that correct? 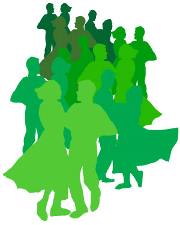 Many of the basic figures in contra dancing are similar to figures in square dancing. If you are already acquainted with swings, promenades, dos-si-dos, and allemandes, you will find much of contra dance to be familiar. However, contra dancing is done in lines rather than squares. You will be dancing with everyone in your line instead of just three other couples. Moreover, the culture of contra dance differs from that of square dancing. You don't need to sign up for a series of lessons or have a regular partner. All that said, both local and out-of-town callers occasionally include a square dance or two in their dance programs, as well as circle "mixers," triplets, and the like. What is the music like? Live music is the essence of contra dance, and every week we have live music! Instruments you'll hear include fiddle, mandolin, banjo, guitar, keyboard, accordion, and percussion. The music consists of old-time reels, Irish jigs, other traditional tunes, or even modern compositions. The tempo is upbeat and lively. Check out this sound clip from a Los Angeles band that we love: The Syncopaths. Is contra dance difficult to learn? No. Contra dance is essentially choreographed walking: if you can walk, you can learn to contra dance. Every dance is taught, or walked through, by the caller before the dance begins. Once the dance is under way, the caller prompts the dancers until they are dancing the sequence on their own. If you forget what the next move is, other dancers will assist you. On Friday evenings we offer an introductory lesson from 7:30 to 8 p.m. (7 to 7:30 p.m. on Saturdays), just prior to the dance, so that beginners can learn the basic dance figures. You may want to attend the introductory lesson several times, as different callers present the material differently, and you'll understand more each time. As the evening begins, our experienced dancers are likely to ask you to dance right away to help you along. Beginner couples are encouraged to split up and dance the first few dances with experienced dancers. Can I just watch for a few dances first? We recommend instead that you jump right in and learn as you go. The first dances are the easiest and teach the basic skills; the dances become more difficult as the evening progresses. To avoid drowning, jump into the shallow end of the pool first! Do I need to bring a partner? No. Many people arrive alone. Most people change partners after each dance. Contra dancing is one of very few dance forms in which you are likely to have danced with everyone at the dance by evening's end. Many times there will be more women present than men, or vice versa. In these cases women may dance the lead part, or men may dance the follower part as necessary. Who asks for a dance? In contra dancing there is no need to be a wallflower waiting for someone to ask you for a dance! It is completely acceptable for beginners to ask experienced dancers to dance, women to ask men or women, and men to ask other men. As soon as one dance is over, most people act quickly to find another partner for the next. Don't be shy, or wait to be asked. Make eye contact, and get a partner right away! Do I need special clothing? No. Contra dancers tend to dress informally. Most people dress for comfort and in anticipation of vigorous exercise. Many women prefer lightweight, swirly skirts, while the men often wear lightweight slacks, jeans, or shorts. Many dancers bring a spare shirt or top for a fresh, dry change if they get sweaty. Above all, be sure to wear soft-soled, comfortable shoes, such as dance shoes, walking shoes, or sneakers. Please, no cowboy boots, leather street shoes, or high heels because these can damage the floor. One point of "contra culture etiquette" bears mentioning here: Most contra communities desire and appreciate an atmosphere that is free of strong-smelling perfumes, colognes, and aftershaves. Please refrain from using them when you come to dance. What if dancing makes me dizzy? The first few times you dance, you may become dizzy due to all the spinning moves. To reduce dizziness, do not look out at the room, or down at your feet. Instead, keep your head level and oriented forward, and fix your gaze on a specific point on your partner, such as a piece of your partner's clothing. (Even better, keep eye contact with your partner if you can!) If necessary, ask your partner to slow down the swinging and spinning. The more you dance, the less noticeable the dizziness becomes. Watch this excellent graphic demonstration for more tips on kicking those dizzies to the curb! Do I have to join a club? No. There are no dues or monthly fees. A nominal fee is charged at each dance to cover the cost of the caller, band, and refreshments. Are contra dancers expected to observe a code of conduct? Yes. San Diego Contra Dance is an inclusive dance community committed to providing a safe and enjoyable environment for everyone. To that end, we have published some guidelines as to proper conduct at a contra dance, as well as guidelines for contra dance etiquette. Please take some time to read these two documents, and do your part to ensure the safety and comfort of all dancers in attendance. If you experience an uncomfortable or inappropriate interaction at one of our dances, or if you witness inappropriate activity taking place, we strongly encourage you to speak with one of our dance committee members, or with the caller, or the dance manager right away. You can also report an incident in writing by using our Incident Report form online. I play an instrument. Can I join the band? Yes! Our community band is called The More the Merrier. Contact Martha Wild, coordinator of the band, for more information and to get on the email list for rehearsals and other announcements. Be sure to download the band's playlist, and check out this index of printable sheet music which links to 90 PDF files that you can download and print for use with the band. Where can I obtain more information about contra dance? 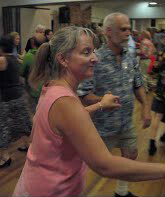 After attending a number of dances, many people find that they want to delve more deeply into the contra dance culture, the intricacies and techniques of dancing and calling contras, and playing music in contra dance bands. Please visit our page titled Resources for Musicians, Callers, Dancers, and Beginners when you're ready to learn much, much more. Don't be afraid to ask the callers and band members for more information—everyone is here to help you make the most of your experience, and to have fun!